I was in a place, and there were people there, and we were doing something. Could this be any more vague? I’m blurring the details; I don’t want you to know when or where this happened, because…I may have stolen a pencil. We were filling out forms. Pens were provided. They were in coffee cups, or some other type of container. I can’t remember, actually. And these pens had a company name or logo, on them–the name or maybe logo of the company which organized the event I’m tap dancing around instead of describing now. In short, they were promotional pens. We were supposed to take them. There were a few pencils too, in the same containers, but the pencils didn’t have any names or logos on them; they were just some random, non-promotional pencils. At this “event” the “organizers” were also giving out notepads, or maybe they were binders full of worksheets we were supposed to fill in, or perhaps they were surveys. Maybe I’m leading the witness, but I’m trying to establish context–we were all grabbing things to write on, and things to write with. Holy 3.14! 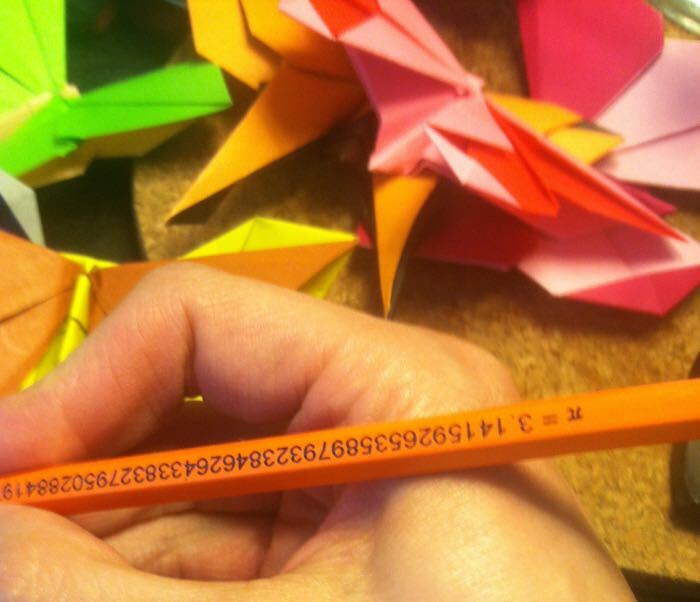 A pi pencil! One of the most famous numbers in math! I had never seen a pi pencil before. And it was a lefty! That is, Pi only displays correctly if you’re writing with your left hand. If you write righty, Pi is upside down. And it hadn’t been sharpened much yet. It hadn’t lost any digits. I guess you could say it gets “less precise” as you sharpen it! Har! A math joke. I wanted to show this to one of my math students. But to do that, I’d have to take it home with me. I would have to keep it. I thought about this for a while. I attended a very small college in New England, and one semester there was a campus-wide debate going on about cups from the dining hall. The cups were non-disposable, and they were disappearing, because too many people were taking them to their dorm rooms and not bothering to return them. So the cafeteria stopped offering cups. Each student was issued a plastic mug. Everyone wrote their name in black sharpie on their mug. Some people added nifty designs, like peace signs and flowers. It was a hippie school. Students could use their personal container to drink in the cafeteria and then, if they so desired, they could use their personal container to bring some more liquid to their dorm room. Students were responsible for cleaning their own mugs, presumably in the restrooms. A few of us started drinking out of bowls. I liked to take a slurp of grape juice from my bowl and then say, “It means they’re falling in love again.” I don’t know if anyone got it. Anyway, during a discussion about the cups issue, my philosophy professor told us he thought of the cups in the cafeteria in the same way that he thought about pens and pencils, just a tide coming in and going out, a resource which one dipped into when needed, and which one contributed back into without really thinking about it. Sometimes you picked up a pen or pencil, and other times you carelessly left a pen or pencil behind, and someone else who needed one picked it up. Like the little cup of pennies next to the cash register. Like breathing out and breathing in. But his argument doesn’t make sense once the objects in question become “special” to any of the parties involved. If you really want to keep one of those pens or pencils, if you would be sad if you left it somewhere, then you have to assume that someone else could feel the same way about that pen or pencil, and then the golden rule goes into effect: you wouldn’t want someone to keep your special pencil, so you certainly shouldn’t keep theirs. And so, the more special a pi pencil becomes to you, the more wrong it gets to take it from a coffee jar at a function. But then you remember that you are one of the thousand or so people on earth who have an unhealthy obsession with pencils, and you realize that by the same golden rule, if the owner knew how much you were worrying yourself over this one silly pencil, they would insist that you take it. After the “event,” I sat in my car for a few minutes, listening to the radio and mulling over the day. Then I reached into my pocket. I wanted to admire my lovely new pi pencil, but–cripes!–it was gone. I searched every pocket again. I patted myself down like a police officer. I’d lost it. What an idiot! I was more upset than I should have been. If it was okay for me to take that pencil, it would have to be just as okay for me to give it away. The stream had to run freely in both directions, with pencils flowing towards me, and pencils flowing away from me, back into the “commons” of writing implements. Clearly, I would have to accept losing it. I laughed to myself. It made sense. And I accepted it. Then I saw the pencil. It had fallen on the floor of my car, between the door and the seat. I picked it up and looked it over. It really was nice. And it really was mine, for now. Didn’t get your joke about the grapefruit juice. But I appreciate the special reasoning you applied to stealing that pencil. Definitely a keeper, even if you aren’t a lefty. Stealing that pencil? Who said anything about stealing?